Property developer Hunza Properties Bhd will embark on a green concept residential development project in Tanjung Bungah, Penang. Its executive chairman Datuk Khor Teng Tong said the project is a joint venture with another company and is currently in the planning stages. "The designs and concept of the project will be finalised soon. Once finalised, the plans will be submitted to the relevant authorities for approval," he told reporters in Penang recently. The development will look at energy-saving, minimisation of sun's rays and a reduction in construction waste. Khor said the project will be targeted at local buyers. "We are looking into between 1,300 sq ft and 1,800 sq ft in build-up area for each (residential) unit," he added. Khor said the decision by the Penang state government to increase the density of housing projects on the island will help bring the cost of land down, stabilise property prices and give consumers more choices. He said the increase in density was timely as property prices are expected to escalate in two years. 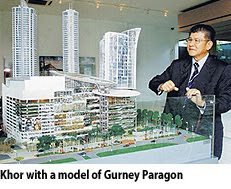 Another project the developer will embark on is the RM420 million Gurney Paragon shopping mall, with a gross built-up area of 1 million sq ft and 700,000 sq ft of lettable area. Khor said the designs and plans for the seven-storey shopping mall have been finalised and submitted to the relevant authorities for approval. "We hope to start work by year-end or early next year," he said. On the outlook of Penang's property market, Khor said the state is currently short on supply of residential properties, although demand for housing is rising. "The shortage of supply is mainly due to a (development) slowdown by developers. Not many new housing projects have been launched in the past one year." Mines Excellence founder Tan Sri Lee Kim Yew declines to reveal his offer price for the golf resort, but market sources put its worth at about RM30 million. Property developer Mines Excellence Golf Resort Bhd said it is in talks with the the Selangor state government to acquire the Bukit Beruntung Golf & Country Resort. "We are talking to the state government now. They have assigned a special officer to look into this matter. If the state decides to sell the golf resort, I will buy it," Mines Excellence founder Tan Sri Lee Kim Yew said in an interview. He declined to reveal his offer price for the golf resort, but market sources put its worth at about RM30 million. Lee had initially wanted to take over the management of the golf resort from businessman Tan Sri Chan Ah Chye of Talam Corp Bhd, but found that the latter had contra the property to the Selangor state government. The proposed property will complement Mines' existing Mines Golf City development, located adjacent to it. The five-star 160ha Bukit Beruntung golf resort in Selangor consists of a 36-hole golf course, a clubhouse with a theatrette, 900 bungalow lots, a driving range and specialist shops. A source said the value is only for the 160ha land, and a further RM10 million may be required to upgrade the clubhouse, driving range and infrastructure, and other amenities as the condition of the properties has deteriorated over the past few years. Meanwhile, Mines Excellence, which is developing the Mines Golf City in Bukit Beruntung for RM3 billion, expects the project to start early next year. It will feature a 63-hole golf course, hotels, a university, a clinic and spa, townhouses and bungalow lots. Lee said however, a 99-hole golf resort (by integrating the 36-hole Bukit Beruntung golf course and the 63-hole Mines golf course) would attract more golfers to Malaysia and promote the tourism sector. On Bukit Beruntung acquiring an unwanted stigma due to the number of abandoned houses, lack of amenities such as hospitals and schools and poor infrastructure, Lee said he has approached the local council on his willingness to adopt the 1km road leading up to the township. Lee wants to also improve the landscape and clean up parts of Bukit Beruntung. "Bukit Beruntung is rundown. My own estimate is that there are 30,000 tonnes of rubbish thrown by the road side and we don't mind cleaning that up," he said. Lee said he will spend some RM3 million on these initiatives. SUNWAY City Bhd is expected to maintain its profitability, given the prime locations of most of its projects, said RAM Ratings. Concurrently, the group's financials will remain anchored by stable, recurring investment-property income, the rating agency said in a research note today. "We note recent healthy buying interest in certain projects, driven by low interest rates and the developers'' easy-financing schemes," it said. Over the next six-12 months, RAM Ratings said this should boost sales with strong branding and strategically located projects, including Suncity. The rating agency pointed out that Suncity's debt burden remained heavy with RM1.52 billion of borrowings as at the end of June 2009. In the medium term, the group's debt load is projected to increase to around RM2 billion. However, Suncity's debt-coverage metrics are anticipated to remain adequate. RAM Ratings said a sustained and substantial reduction in the group's borrowings would be a key factor for any reassessment of Suncity's ratings.